This item is a 3.75” non-articulated Vinyl figure. From 2K Games' multiplayer game, Evolve, Val is one of the invaluable Support Hunters, with the ability to turn all nearby allies invisible! 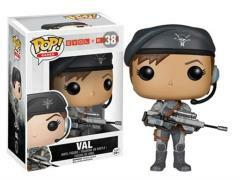 The Evolve Val Pop! Vinyl Figure measures approximately 3 3/4-inches tall. Hunt or be hunted!